Generally the assessment showed that those living closest to the landfill were more familiar with the landfill and park plans and expressed more interest in visiting the Park. Most respondents were at least somewhat familiar with the landfill and with the plans to develop Freshkills Park, and after reading the materials provided about park plans in the assessment, between 75 and 80% of those who responded supported the Park plans (Vogt, C.A., Klenosky, D.B., Snyder, S.A., & Campbell, L.K., 2015; Klenosky, D.B., Snyder, S.A., Vogt, C.A., & Campbell, L.K., 2017). 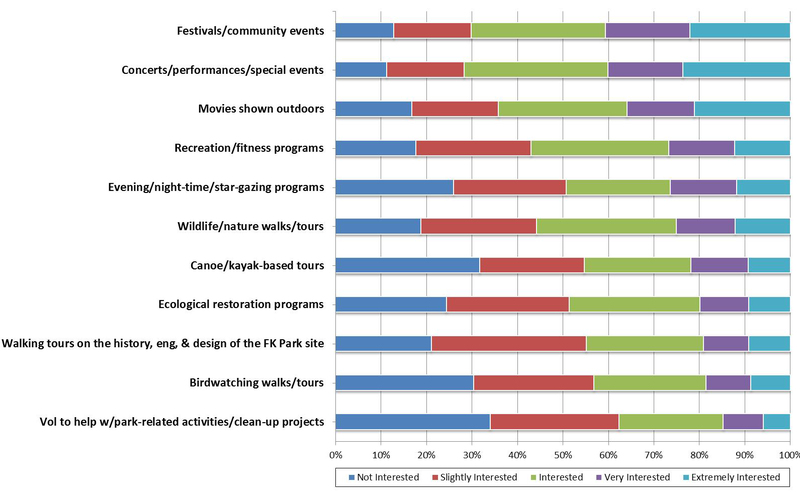 Respondents were also asked to indicate their level of interest in different programs that might be offered at the park and respondents reported being most interested in attending cultural and community based programs (see graphic below). Opinions about safety, accessibility and visiting Freshkills Park were also assessed. Most respondents were excited about the idea of visiting the Park. At the same time, respondents’ beliefs about safety from health risks were fairly evenly split between those who agreed they would be safe from health risks, those who were uncertain, and those who thought they would not be safe from health risks. More on the assessment can be found on the US Forest Service Website. In light of the responses to the assessment, students in the 2012 Columbia University Master of Science in Sustainability Management Capstone Workshop developed a communications strategy to address public health concerns surrounding Freshkills Park. 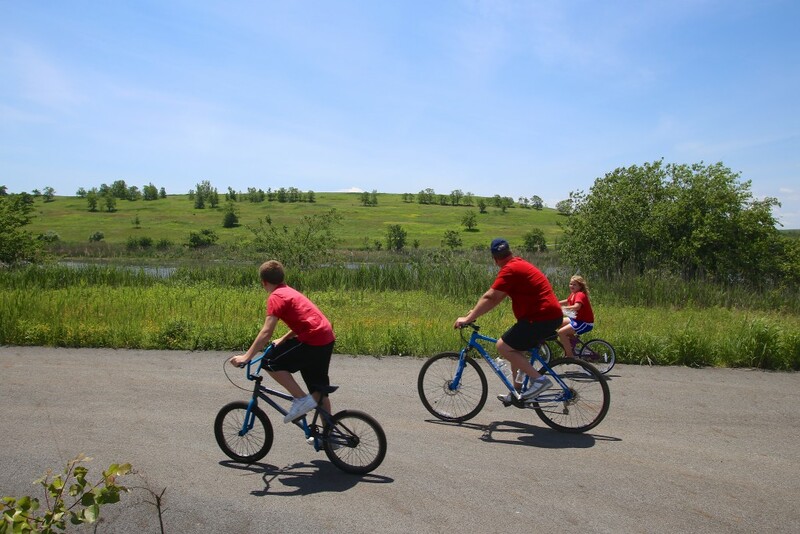 The strategy was implemented by the Freshkills Park team in conjunction with an increased effort to bring people to the Park for special events, environmental education and public informational tours. A follow up assessment was conducted in 2015 by NYU students in the Masters in Public Administration program as their capstone project. Close to 500 people responded to this electronic assessment and nearly 65% of them had visited the Park during one of the special events held between 2011 and 2015. Respondents were overwhelmingly positive about Freshkills Park, with over 80% of respondents stating they are strongly in favor of visiting. Respondents continue to be interested in arts and cultural activities especially outdoor concerts and music festivals. The most popular recreational activities were ones already offered at special events: kayaking, bicycling, walking, and hiking. Wetlands, wildlife, and bird watching tours and workshops were among the most popular science activities.